The workshop will bring together scholars of the history of healing practices and medicine in non-western societies to explore how emic boundaries between religion and medicine were established in different historical non-western contexts. As part of the research programme of the KFG “Multiple Secularities – Beyond the West, Beyond Modernity”, the workshop seeks to explore historical case studies from different regions of Asia and the Islamicate world to compare if and how religious and medical knowledge systems and practices are defined, distinguished and demarcated in emic discourses and practices. By focusing on emic taxonomies and classifications of concrete case studies, we will avoid the antagonistic essentialism of the modern Western concepts of “religion” and “science”. Instead, we will probe if and to what extent premodern societies set apart and combined religious and non-religious knowledge systems and practices that are hard to grasp with our etic and modern dichotomical taxonomy of medicine and religion and thus in further consequence spawn terminological conjunctions such as magico-religious medicine, spiritual healing or an immanent-transcendent body frame. These etic labels blur the distinctive practices and discourses in a concrete historical setting and gloss over emic boundary drawings and demarcations that may not primarily be focused on a separation of medicine and religion, but on other social, economic or political realities and challenges. We invite the participating scholars to present their historical sources and case studies and introduce us to the unique ways their primary source material allocates and evaluates concepts, discourses and practices to metaphysical or non-metaphysical spheres. Can we trace emic distinctions or differentiations between medicine and healing practices and rather religious, metaphysical non-medicine? Are for example some practices regarded as “superstition” and not worthy of a physician? Are certain theories and concepts of healing only held by religious specialists? Is there a discussion of these distinctions in primary source material? What sort of distinctions come up? Is there an emic terminology in which distinctions are expressed? Are these distinctions and differentiations located on the plane of theory and concepts or rather in everyday healing practices? Why is that so? Are there certain historical circumstances or events that caused or influenced the emergence of such distinctions? Who put these distinctions forward? Was there an institutionalization along the lines of these distinctions? Were there counter-reactions and counter-movements against certain forms of distinctions? By whom and why were they proposed? Sociological differentiation theory holds that in evolved societies, the “systems” of religion and medicine serve special functions for the society at large. Whereas “religion” operates with the code “transcendent/immanent” and will serve the function to reduce contingency (e.g., by applying meaning to “suffering” as such), “medicine” (or modern biomedicine, for that matter) applies the code “sane/ill,” and will become active in the case of illnesses that can be cured. Thus, there is a more or less strict division of labour between the systems of “religion” and “medicine.” But can such an ideal-typical difference of religion and medicine be of help in analysing the pre-modern relationship between Tibetan Buddhism (as “religion”) and Tibetan medicine? In principle, several answers are possible: First, it may not be of use since in medieval Tibet, a functional differentiation of “religion” and “medicine” was absent. Second, it could turn out that either “Buddhism,” or “Tibetan medicine,” or both, cannot be sufficiently described with the modern categories of “religion” and “medicine,” respectively. Or, finally, it could fit, and thereby offer an interesting perspective in regard to functional differentiation in pre-modern Tibet. The contribution will aim to discuss these questions in outlining differences between religious and “secular-medical” conceptions of the etiology of illnesses, and healing, in pre-modern Tibetan Buddhism. As it seems, the foundational text of Tibetan medicine, the “four-root Tantra” (rGyud bzhi), compiled from earlier sources in the 12th century, offers competing frameworks of explaining the causes of illness and healing. These frameworks affect the portrayal of the role of the (Buddhist) physician in the healing process, e.g., the advice given to healer-physicians not to interfere in cases of terminal illnesses. This offers evidence that at least in certain respects a clear division between the “systems” of “religion” and “medicine” can be observed in pre-modern Tibet, too. “Medicine” appears to be exceptionally well suitable as an example of a distinct, non-religious nexus of social activities, since it is easily distinguishable as a social field defined by its specific function. On the other hand, however, its relationship to religion is extremely complex. All sorts of actors, which we would regard as representatives of the social field “religion” were engaged in healing practices in ancient and medieval Japan. Furthermore, a large proportion of healing practices as described in the available texts, from the modern observer’s perspective, are of a decidedly “religious” nature. For the sake of complexity reduction and conceptual orientation, I will try to disentangle all relevant elements involved in healing practices – i.e. social and epistemic structures, means and ends of healing practices, and their framing – in order to show that we can analytically distinguish “religion” and “medicine” as discrete social fields, despite all the evident difficulties. This paper will focus on academic Tibetan medicine (gso ba rig pa) in the early modern period (largely the 16th-18th centuries) with some reference to earlier writings. It will discuss ways in which medicine distanced itself from Buddhist authority structures in order to free the space for empirical observation and scientific methods. But such a polarity was never fully articulated, and many elements of Buddhist worlds of value, not to mention cosmologies and epistemologies, were assumed or creatively adapted in medical theory and practice. The paper will explore several sites in the intellectual history of Tibetan medicine where the latter exhibited traits often associated with European modernity, and the Tibetan turns of phrase that were mobilized to talk about newness and the autonomy of science. It will provide evidence of a clear awareness of the disparity of systems of knowledge and of cultures in medical writing, which served to undermine the possibility that any single dispensation, such as that of Buddhism, could govern all knowledge. Such awareness also entailed an underscoring of the importance of historical temporality. Finally, the paper will demonstrate how some of the tensions between Buddhist forms of knowledge and medical ones in Tibet are visually evident in a stunning illustrated medical encyclopedia from the late 17th century. 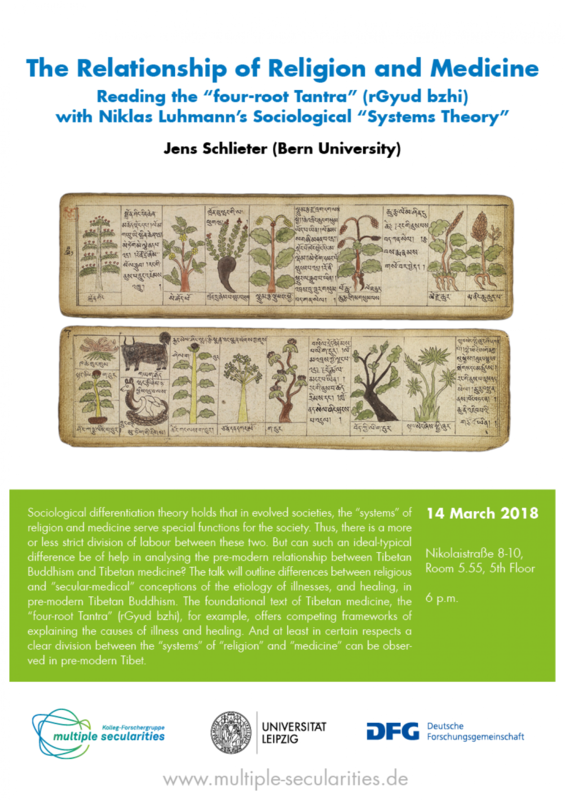 In light of the questions and topics raised in „Multiple Secularities – Beyond the West, Beyond Modernities“ I will explore the concrete use of mantras and rituals in Tibetan medical sources, an investigation which has not been done yet systematically by scholars. It will be investigated in which medical context mantras and rituals, which both typically stand for the 'religious,' are recommended. Are they used to transform medicinal substances? Are they employed in case of special diseases or at particular stages of medical treatment? If so, how firmly are they established in medical texts? Are they just accessary parts and not really 'medical' or do they form an integral part of medical expertise in premodern Tibet? This presentation will thus question our understanding of Tibetan medicine from an emic textual perspective of healing practices. On the level of discourse, pre-modern Islamicate cultures placed medicine and religion in different groupings of knowledge: medicine was one of the “sciences of the ancients” or “rational sciences”, derived from the Late Antique Hellenistic tradition, while religion (or rather, various types of religious studies) belonged the “sciences of the Arabs” or “revealed/traditional sciences”. Academic study of medical theory and practice has tended to rely mostly on writings by physicians, anything else being ignored or categorized as “superstition” or “magic,” rather than medicine. Since the 1990s, it has become increasingly clear that the theory and practice of medicine in Islamicate cultures needs to be understood on its own terms, and not merely as a reworking or adaptation of Hellenistic themes. Nowhere is this more obvious than in the Mamluk period, in which the line between medical and religious specialists becomes increasingly blurred. In the same period, Training as both physicians and Islamic jurisprudents enabled men like Ibn al-Nafīs (d. 1288) to propose new understandings of human physiology. Despite appearing to be precursors of modern ones, these understandings are based rather on contemporary debates about the relationship between reason and revelation. Another product of those debates is the fascinating genre of Prophetic medicine, in which religious specialists appear to have co-opted Galenic medicine entirely in their interpretation of traditions (hadith) of Muhammad. At the same time, however, the limited evidence we have of medical practice seems to show that the Mamluk period differed little from earlier periods: physicians trained in the Galenic tradition jealously guarded their position and regarded other practitioners as charlatans. Building on the work of Irmeli Perho, Nahyan Fancy, Paulina Lewicka and others, I will attempt to answer the guiding questions of the call for papers, focusing particularly on medical knowledge appearing outside physicians’ writings. What does it mean to “count” in early classical India, and, more particularly for the purposes of this paper, what does it mean to inventory all of the components of the human body, and what do those inventories tell us about medical ideas and practice? To answer these questions, I will compare the lists of body parts in the sārīra-sthānas (the “sections relating to the body”) of the Caraka-samhitā (ca. first century C.E.) and the Susruta-samhitā (ca. second century C.E.). It is my hope that such a comparison will facilitate an inquiry into the meanings of such lists. I do not intend to provide you with an exhaustive list of the discrepancies between the inventories in both texts. A. F. Rudolf Hoernle devoted an entire book on the discrepancies in the “bone counts” found in the seventh chapter of the sārīra-sthāna of the Caraka-samhitā (which lists 360 bones in the human body) and in the fifth chapter of the srīra-sthāna of the Susruta-samhitā, which lists a total of 300 bones. In a nutshell, the discrepancies mainly concern a difference of fifty-six items, the 32 sockets of the teeth (danta-ulūkhala) and the 20 nails (nakha) of the hands and feet. Caraka accepts these items as “bones,” whereas Susruta does not. Other differences in “what counts” emerge during a close comparison of these fascinating passages, and what I hope to accomplish here is not to provide a detailed list of differences, but to contemplate what these differences “mean” in terms of counting as a practice, and what they mean in terms of how we might think about these two texts as the written representations not of two distinct “schools” of medical thought, as Hoernle and others would have it, but in fact, of the articulation of two specialties: the “theorist-physicians” of the Caraka-samhitā and the “anatomist-surgeons” of the Susruta-samhitā. What are the agendas and goals of these two passages, and how are these accomplished via enumeration? We encounter two positions, and two very different ways of dealing with discrepancies. As Michel Foucault might have asked, “What passes ‘between’ Caraka and Susruta, if anything, on issues of anatomy? We might say that on the one hand, we have Susruta's “language of precision” versus Caraka’s “language of theory.” These two medical samhitās in no way demonstrate the passage of language into “rational discourse,” but, in fact, they demonstrate different types and degrees of rationality. We come upon remarks on the relative values of “inference” versus “direct observation,” different types of cultivated wisdom, and ultimately, a juxtaposition of pragmatic medical knowledge with theological and soteriological notions concerning textual authority and final emancipation. Ideas of conception as originally espoused in the context of the Buddhist teachings in ancient India arrived in Japan via Chinese translations of the “Sūtra on Entering the Womb” (Garbhāvakrāntisūtra) and other texts. The Buddhist texts describe conception as a process enticing and introducing a being from an intermediate state into a new existence full of terrible suffering. The texts list the names of various afflictions, gleaned from medical compilations in India of the time (around second century CE), as a means to emphasize the healing power of Buddhism. Adherence to Buddhism liberates from physical suffering by ending the cycle of conception, rebirth and death. The therapeutic outlines that follow the description of the afflictions in the Indian medical texts, however, are absent in Buddhist texts such as the “Sūtra on Entering the Womb”. There is thus a clear distinction between the aim of religion (Buddhism) and medicine: The first aims at the salvation from human existence while the second aspires to the healing of disease. However, we find ample evidence that Japanese Buddhist monastics not only engaged in ritual healing with incantations but also in medical healing with drugs, moxibustion and surgery. In this way, the fields of engagement between healing as salvation and medical healing overlapped, often creating fields of tension and contestation. The paper explores the emic terminology used to mark differences and locate distinctions concerning human reproduction in Japan where Chinese-style medicine was incorporated along with Buddhism as of the sixth century. This paper focuses on how the practice of acupuncture played out in a set of spirit revelations recorded by a fourth-century Chinese gentry family, the Declarations of the Perfected (Zhen’gao 真誥 DZ 1110). I argue that modern binary distinctions between the supernatural and the natural fail to account for the fluid interpenetration of these domains in Daoist healing. Similarly, identifying “religions” solely as sociologically bound communities does not inform how they are “religious,” merely that they are “other” communities of practice. This paper proposes that a praxiological approach, which focuses on processuality and the emergence of knowledge distinctions, allows us to discern what we might call religion or medicine today, but in terms which are thickly contextualized in the language of the moment. This allows us to pay serious attention to the conditions in which these distinctions emerge. Through close reading of four passages on acupuncture, this paper demonstrates how the practice was negotiated, compared, re-evaluated in the light of different practices and knowing styles. They consider the coherence, hierarchy and difference between acupuncture and various other practices – incantation, geomancy, sexual cultivation, visualization of body gods — and transpose these relations onto cosmological schemes of order. Each section of text reveals different kinds of negotiation. One identifies different, but connected, realms of influence in the genesis of disease: the tomb, the heavenly bureaucracy and the body. Another compares what doctors know to what initiates know about esoteric body points. A third juxtaposes the trans-life problem of reincarnation to the this-life problem of disease. And a fourth uses gender and the domestic realm to cajole a patient to get acupuncture. “Religion” and “Medicine” emerge from this not as stable, transcendent, transhistorical objects — rather they are relational stances, means to position oneself amongst contemporary forces, contingent on, and embodied within, the conditions of particular moments.